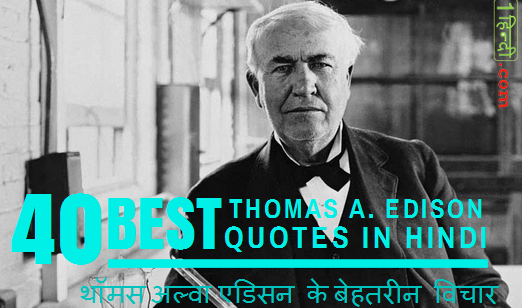 Thomas Alva Edison Quotes in Hindi थॉमस अल्वा एडिसन के 40 बेहतरीन कोट्स , क्या आप थॉमस अल्वा एडिसन के प्रेरणादायक विचारों को जानना चाहते हैं? क्या आप Thomas Alva Edison के अनमोल विचारों और कोट्स से प्रेरित होना चाहते हैं? #1 Our greatest weakness lies in giving up. The most certain way to succeed is always to try just one more time. #2 Opportunity is missed by most people because it is dressed in overalls and looks like work. #3 I have not failed. I’ve just found 10,000 ways that won’t work. #4 There’s a way to do it better. #5 There is no substitute for hard work. #6 Genius is one percent inspiration and ninety-nine percent perspiration. #7 Being busy does not always mean real work. The object of all work is production or accomplishment and to either of these ends there must be forethought, system, planning, intelligence, and honest purpose, as well as perspiration. #8 What you are will show in what you do. #9 Many of life’s failures are people who did not realize how close they were to success when they gave up. #10 The three great essentials to achieve anything worth while are: Hard work, Stick-to-positiveness, and Common sense. #11 To invent, you need a good imagination and a pile of junk. #12 Nearly every man who develops an idea works it up to the point where it looks impossible, and then he gets discouraged. That’s not the place to become discouraged. #13 Non-violence leads to the highest ethics, which is the goal of all evolution. Until we stop harming all other living beings, we are still savages. #14 I never did anything by accident, nor did any of my inventions come by accident; they came by work. #15 Restlessness is discontent and discontent is the first necessity of progress. Show me a thoroughly satisfied man and I will show you a failure. #16 The best thinking has been done in solitude. The worst has been done in turmoil. #17 The value of an idea lies in the using of it. #18 I am proud of the fact that. I never invented weapons to kill. #19 What a man’s mind can create, man’s character can control. #20 When I have fully decided that a result is worth getting. I go ahead of it and make trial after trial until it comes. #21 Opportunity is missed by most people because it is dressed in overalls and looks like work. #22 If we did all the things we are capable of, we would literally astound ourselves. #23 Just because something doesn’t do what you planned it to do doesn’t mean it’s useless. #24 We don’t know a millionth of one percent about anything. #25 There is far more opportunity than there is ability. #26 I start where the last man left off. #27 When you have exhausted all possibilities, remember this – you haven’t. #28 There is time for everything. #29 I find out what the world needs. Then I go ahead and try to invent it. #30 Nature is truly wonderful. Only man is truly foul. #31 Great ideas originate in the muscles. #32 We will make electricity so cheap that only the rich will burn candles. #33 This problem, once solved, will be simple. #34 Vision without execution is hallucination. #35 All bibles are man-made. #36 Be courageous. I have seen many depressions in business. Always America has emerged from these stronger and more prosperous. Be brave as your fathers before you. Have faith! Go forward. #37 The chief function of the body is to carry the brain around. #38 Five percent of the people think; ten percent of the people think they think; and the other eighty-five percent would rather die than think. #39 I never did a day’s work in my life. It was all fun. अगर आपको Thomas Alva Edison के यह 40 Best thoughts अच्छे लगे हों तो comments के साथ-साथ शेयर करना ना भूलें ! धन्यवाद ! असफलता ही सफलता का नाम है सच कर दिखाया महान् आविष्कारक ने अन्धकार को उजाले में परिवर्तित कर के..
इससे हमें प्रेरणा मिलती हैं की कार्य के प्रति बार बार मिल रही असफलताओ से ना घबराये और असफलता क्यों मिल रही हैं उसके कारण को खोजे और कार्य को करे तो सफलता अवश्य ही कदम चूमेगी..
धन्यवाद… आप का ब्लॉग तारीफे काबिल हैं हमेशा ज्ञान से जुडी सामग्री यहाँ प्राप्त होती हैं हम जैसे पाठको को….